The Old Canal, Schmitz-Horning Co., Cleveland, Ohio, scenic mural, four sections each 40″ wide x 80″ high. Cleveland scenic wallpaper and lithographic mural company, Schmitz-Horning Company (operating roughly between 1903-1964), hired many local and nationally-recognized artists to design their lithograph murals. The company used high quality paper with oil-based inks that were fully washable, and their product was claimed not to fade. Some of the artists hired worked in-house while others worked out of their studios. Once an artistic sketch or the study was created on paper or illustration board, litho-crayon (grease) artists would enlarge the designs onto zinc lithographic plates for printing. With mural sections at 40″ x 80″ plus, these color lithographs were printed on some of the largest printing presses in the country at that time. 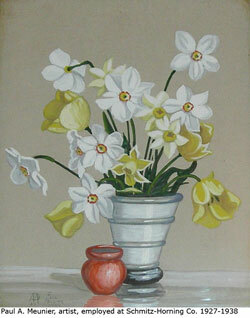 Paul A. Meunier, gouache floral painting, 1937 – employed at the Schmitz-Horning Co., Cleveland, Ohio, 1927-1938. Some of the artists who designed for Schmitz-Horning include Henry G. Keller, Glenn M. Shaw and Elsa V. Shaw, Carl Broemel, Paul A. Meunier, Carl Fuchs, Paul Haas, Hugo M. Schmitz, and others – many of them studying or teaching at the Cleveland School of Art (they had a mural department) and the Cleveland Museum of Art, and some were members of Cleveland’s Art Club. The company was originally a lithographic poster plant and then developed a line of litho murals which later developed into scenic and floral wall decorations. Although wallpaper was the main source of sales, many posters and displays were printed for advertising agencies. You are currently browsing the Janet Dodrill's Blog blog archives for June, 2015.